Overconfidence is a behavioural bias that is especially dangerous in financial markets. 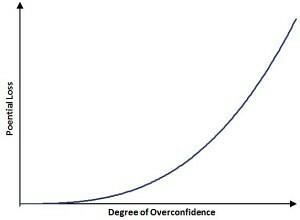 The tricky thing about overconfidence is that we think it doesn’t affect us, the more overconfident we are. Overconfidence implies we tend to overestimate our knowledge, underestimate risks, and exaggerate our ability to control events (see illusion of control). In other words, we tend to overestimate our abilities and the precision of our forecasts. We set overly narrow confidence intervals around our forecasts and we tend to overweight our own forecasts, relative to those of others. Several biases contribute to investors becoming overconfident. First, there is the self-serving bias, which states that people tend to attribute successes to their own skills, but contribute past failures to bad luck. In the case of stock markets, new information that is in line with the investors’ forecasts will increase confidence, whereas contradicting information will not decrease it as much. Over time, investors will become overconfident. Second, illusory superiority (or above average effect) causes people to overestimate their own abilities. In particular, when people are asked to asses their abilities, the vast majority argues that they are above the average. Hence, we tend to be naturally overconfident. When an investor has performed well in the recent past, he might conclude that he is truly skilled. While a performance streak can indicate skill in trading, the good performance could also be due to luck. In both case, it might cause the investor to become overconfident. This in turn could cause him or her to take more risks and trade more. Why? Because overconfidence will make future trades to look less risky. However, when wrong, the size the potential losses will be higher. In order to avoid overconfidence from adversely affecting our performance, we need to recognize that we’re not as smart as we think we are. One way of tackling overconfidence, is by considering the consequences of being wrong. Avoiding overconfidence from having an adverse impact on performance is an important consideration when making financial decisions.